6700 On-Line Traffic Marking is a 100% acrylic, lead-free premium grade waterborne traffic and line marking paint specially manufactured and formulated for optimal adhesion and durability. Designed with a special sheen to enhance durability, weather resistance and resistance to dirt pick up. Designed to meet TT-P-1952B. Product Advantages: Product will not crack, remains flexible over time, is durable, easy to apply and can be applied by air and airless spray equipment. Requires no thinning, is pre-strained and is environmentally safe and user friendly. 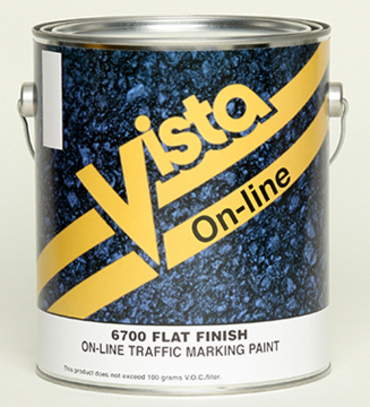 Recommended Uses: On-Line is designed for use as traffic marking, legend identification work, instructional markings on roadways, crosswalks, sidewalks, curbs and parking lots. Colors: White, Red, Yellow, Blue, *Green, *Black.